Define crazy so management can create change. What goes through your head when you hear the word crazy? Does it conjure up someone with mental illness? Or do you see a person dealing with too many demands pulling them in a variety of directions? It’s the latter vision of crazy – the situational crazy – that I want to focus on, especially when it comes to the workplace. Let’s eliminate the concept of crazy being a person and instead see it as a guidepost to indicate the need for change. This concept, of a new vision of what crazy is and means, is the topic I was honoured to speak about at a TEDX event in April, 2017 https://youtu.be/XvS83nXSf0k. My talk focused on redefining the word crazy and asking people to embrace it instead of shunning or stigmatizing it. This encourages people to choose change and create improvement. It was a little controversial because I suggested stepping outside the mental illness bubble (people being labelled as crazy) and use crazy as a descriptor and indicator of how our lives can be overly busy and feel out of control at times (situational crazy). Further, I asked that crazy be a positive and accepted word used to identify the busy times. Busy is part of a normal life – work, home, family, relationships, socializing and community. It is time to rid ourselves of the stigma, automatically thinking about mental illness or assuming people are incapable to function or rationalize when it comes to crazy. By shifting this point of view, people begin to share, be supported and create change in their lives, to face problems or challenges. People need to openly speak about their crazy times so they can recognize them and stop doing what doesn’t work. As a corporate therapist, I often witness crazy situations in workplaces. Regardless of industry, company size or personnel, no one and no company is immune to crazy times. I have found common practices and behaviours within companies and among employees to help others determine if their work and workplace are just normally busy or crazy and in need of change. When regular work hours are jam packed with endless meetings and a sizeable workload, it only makes sense to come in early and/or stay late to get everything done. Used once in a while, this strategy is acceptable, but as common practice, it indicates crazy mode and a need to change workload or availability. When co-workers are away for a day or even extended periods, others might be asked to do their own job as well as someone else’s. In short spurts people will step up to the plate and pitch in to help, but if management runs the company this way and people are doing double duty constantly, this qualifies as crazy. No one can sustain this level of busyness long term. Burnout is inevitable, so it’s essential to assess workloads and fill positions in a timely manner. The open-door policy makes an individual available to others for answers, guidance and support at all times. It sounds great in theory but this easily turns into exhaustion and time management challenges. It’s impossible to balance 100% availability with regular work demands. The result is endless interruptions, feeling a loss of control and ultimately crazy might be the best descriptor. When work suffers because of “over availability”, a change to the open-door is in order. Crazy comes when that once-in-a-while exception to push for extreme outcomes becomes commonplace. For the short term, the team is up to the challenge and can handle unique situations but as a longer term “way of working” the risk for illness or resignations increases. Short term busyness is fine, but ensure it stays short term otherwise crazy becomes a descriptor for the company. A job description outlines amount of work hours, whether they be Monday to Friday or shift work. However, if people are expected to always be “on” and monitor their technology 24/7, it’s unrealistic and excessive. Sometimes the demand is an actual request while other times it’s implied or done through shaming. Ultimately, it’s crazy. Shut down or silence the tech beasts so there isn’t a burnout and bad ending. 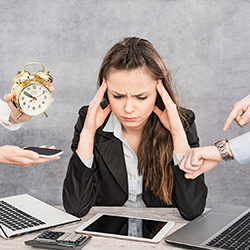 If overtime is common practice in your workplace, there is a workload or performance issue. If it’s workload, it’s indicative of a poorly run company. Peak busy times or seasonal influxes (if very short-term) are fine, but asking staff to continually give more is crazy and contributes to exhaustion/burnout. Change the operations and put a stop to it. When completing tasks at work is not possible and demands at home are beckoning, it may seem sensible to bring work home. This allows the return to family while sneaking in some work where possible. If this is common and family uses the term workaholic, crazy is present. It’s time to set limits and re-assess workloads. These seven signs should not be a shock to anyone, but if you read them and think “this happens at my workplace”, you might not have recognized how demands and expectations have hit crazy status. Finding your workplace in a few signs means there isn’t much normal left. There is no better time than now to embrace the motivation to change your workplace. Take steps to educate bosses and help management realize that crazy has become the “new normal” and it is not okay for more or continued damage. This entry was posted by Pam Paquet and is filed under Business Assertiveness, Time Management. You can follow any responses to this entry through the RSS 2.0 feed. Both comments and pings are currently closed.